Every day, I am thankful to live in - as that song in "Hamilton" proclaims - "the greatest city in the world." But that doesn't keep me from dreaming about and planning adventures to my other two favorite cities - London and Paris. We took an overnight flight out of JFK, and although I used a zillion AAdvantage miles to book business class tickets that had lie-flat seats, I never sleep well on planes. Scott, fortunately, has no problem sleeping; thanks to the hum of the engines, he can be sound asleep as soon as the plane takes off. Based on my history of sleepless red-eye flights, I know better than to plan anything that requires sitting or standing still for more than a few minutes at a time for the day we arrive. So, after landing at Charles de Gaulle Airport before 7 a.m., victoriously speaking understandable French while going through customs and navigating the airport, we hopped the RER train into Paris. We dropped our bags at the hotel, found a café to devise our game plan over coffee and croissants (bien sûr!) and headed straight up - literally - to Montmartre. What better way to walk off the jet lag than to trek around this hill in the 18th arrondisement. 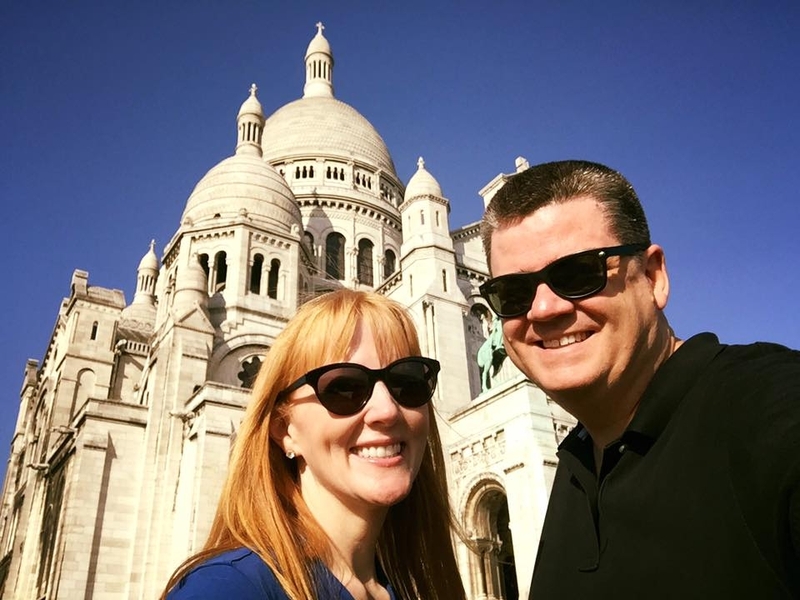 It is famous for the staircase leading up to the gorgeous Basilique du Sacré-Cœur. People start out climbing very quickly, and slow down a bit as they approach the final stretches of steps. If you want to cheat, you can actually take a tram (not visible here) up from the base of the hill (just use one of your tickets from the Metro). But even if you do, you're still not off the hook, as there is not a level stretch of pavement in this neighborhood. Which is fine - because wherever you turn, you will savor a million euro view - either of an adorable street, a long narrow staircase or a panoramic view of the city. And happily - big, dark sunnies hid my very tired eyes all day long. Can you sleep on airplanes? Show me your ways - please! * All pictures taken by Scott, who is, quite simply, a much better photographer than I am. Taking a cooking class was one of the highlights of our recent visit to Paris. I managed to successfully debone a chicken (a first for me), emerging with all 10 fingers still intact. There are no photos of that feat since everyone's hands were covered in chicken goo, so you'll just have to trust me on this. 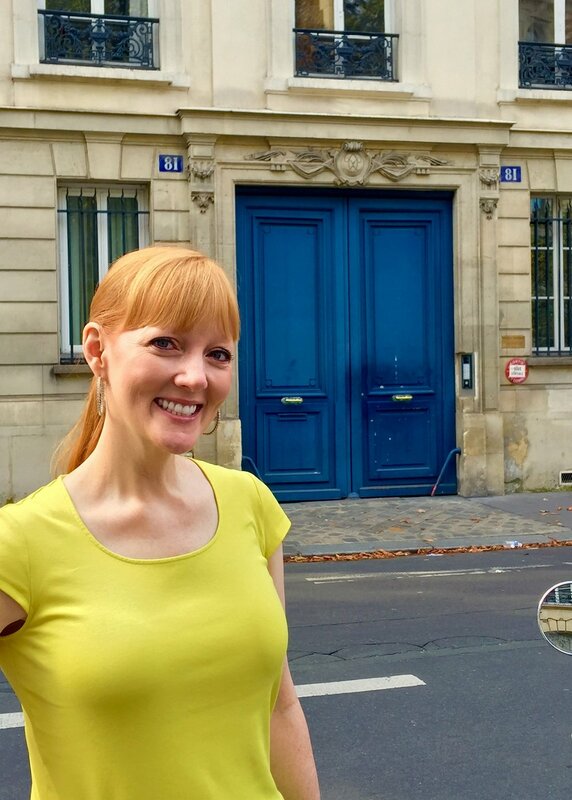 When looking for an English-speaking class, I saw that La Cuisine Paris had amazing reviews on TripAdvisor. Students at my alma mater's study abroad program in Paris have also taken classes here, so those seemed like pretty good endorsements to me. They have a variety of classes, including several popular ones focused on making baguettes, croissants and pastries. Since I am not a sweet breakfast pastry kind of person, and we can find Maison Kayser croissants two blocks from our apartment - we decided on the Poultry (Volaille) class. Also - the "menu" sounded like recipes we might make from time to time in our own kitchen: mushroom soup, stuffed chicken with herbs and mushrooms, salad with a traditional vinaigrette, and vanilla ice cream topped with salted butter caramel sauce. Led by the awesome Chef Cyril (pictured below) - who, as it turns out, also does a lot of TV hosting and interviews - we deboned chickens; made stock; chopped mushrooms, garlic and herbs for the chicken filling; and made the recipes below. Since the class was limited to just 10 people, klutzy people like me got a lot of help wrestling with those chickens. Bonus - this particular class doubled as dinner. We all sat down to enjoy the fruits of our labor at the end of class, in their elegant dining room overlooking the Seine. Put mustard into mixing bowl with vinegar and salt. Gradually whisk in olive oil until well emulsified. (As someone who considers mustard to be a major food group, I will not recommend any specific portion of mustard here, since it might go beyond what many of you would prefer). Place sugar and water in a saucepan. Slowly melt until sugar reaches a golden caramel color. Add cream little by little into the caramel while whisking. Be careful not to let the caramel sauce boil over. Reduced until desired consistency. Transfer to a bowl, and whisk in salted butter. Allow to cool before serving. You can find more info about La Cuisine Paris and their class schedule here.